Confusion. This is the enemy. We do not wish to be confused, befuddled, and frustrated. The argument against complexity is due to the common misunderstanding that complexity leads to confusion. No, it doesn’t have to. This is what good strategy is about: making complex things simple to understand, easy to implement, and delightful to experience. In fact, there are no two people that experience the same thing in the exact same way. So, if human experiences aren’t simple, why should brands be? The best brands are indeed those that are able to keep this complexity intact, without falling into the trap of dumbing down its richness. Think Converse. Throughout the decades of being around, Converse created a multi-dimensional brand, based on layers of accumulated cultural meaning. Instead of being part of some prefabricated brand experience, these cultural connotations come from memories that are simultaneously individual and part of the collective unconscious. Or, think Google. It became such a vast organisation that an extra top layer of complexity – its parent entity Alphabet – had to be created to enable further growth. According to London Business School professor Julian Birkinshaw, not all complexity is bad for business – but executives don’t always know what kind their company has. Imposed complexity: includes laws, industry regulations, and interventions by non-government organisations. It is not typically manageable by companies and most often challenging for brand managers. Inherent complexity: intrinsic to the business, and can only be ditched by exiting a portion of it; like Ford’s reversed fortune from near-bankruptcy to profitability following a series of divestments that included power brands like Land Rover and Jaguar, sold to Tata. 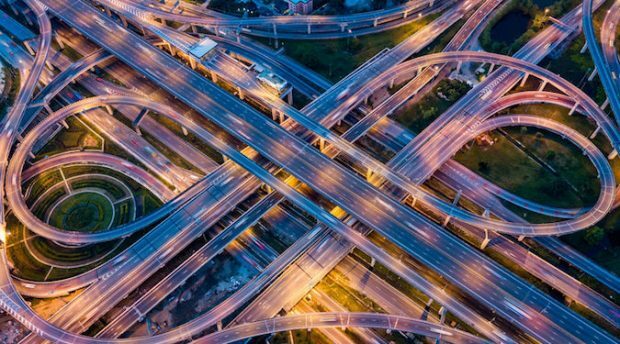 Unnecessary complexity: arises from growing misalignment between the needs of the organisation and the processes supporting it. It is easily managed once identified. Designed complexity: results from choices about where the business operates, what it sells, to whom, and how. Companies can remove it, but this could mean simplifying valuable wrinkles in their business model. The term ‘designed complexity’ is almost interchangeable with brand strategy. A series of complex choices made to address consumers’ needs or unarticulated desires and in a way that creates and sustains value. Disney is possibly one of the most complex and successful brands out there. 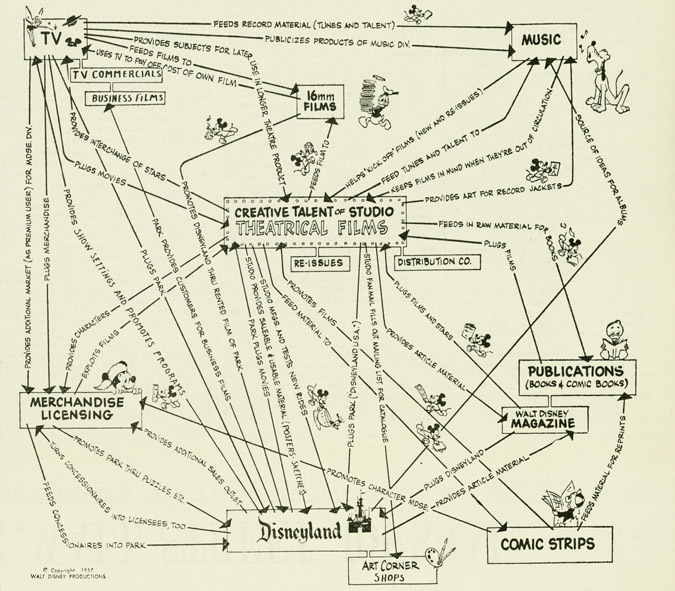 Back in 1957, sketches of an entire business and brand ecosystem (see image below) done by Walt Disney artists at his discretion, were published. This designed complexity clearly emphasised the value-creating ‘wrinkles’ of its franchise entertainment model. Disney’s strategic vision of sustained growth where a central film asset – in very precise ways – infuses value into, and is in turn supported by, an array of related entertainment assets. Foresight about an industry’s evolution, including relevant technological change or evolving consumer preferences. Insight about the distinctive and valuable assets and resources of the firm. Cross-sight — the ability to identify adjacent assets uniquely valuable to the firm or assets with value that others are simply unable to perceive. As simple and clear as an articulation, this is a complex approach that gets even more sophisticated in reality. Has this been an issue? Following recent mammoth acquisitions and the newly named Marvel Stadium, complexity feels quite magical for Disney. From a media communications point-of-view, designed complexity was best manifested by the ‘transmedia storytelling’ methodology, coined by Professor Henry Jenkins, then head of the MIT Comparative Media Studies department. Transmedia storytelling aims at turning an economic imperative into a creative opportunity. As brands have less time to give audiences the chance to identify with their assets and experiences, transmedia storytelling communications becomes an effective extension of a brand. For example,during the promotion period of the film 2012, a microsite was created to explain the science behind the ‘end of the world mythology’ that greatly defined the core idea of the film. That means, new product and media communications developments that extend the movie experience and sales. The driving force behind transmedia storytelling is the growing numbers of media channels and the convergence between these enabling stories to be told through different media like films, books, games, websites, toys and others. This way, people can obtain new elements of the story by consuming different products and services enabling the creation, continuity and marketing of brands where every touchpoint becomes a new, fresh entry point, ripe for participation. A great example of transmedia storytelling franchise is the BBC series Dr Who. After the first series, BBC introduced a first novel about the series. This book was written based on content the fans created. In addition to the book, an audio CD with extra episodes was successfully launched. BBC also introduced a large selection of web-based material like video-clips, podcasts, audio-files and pictures. This broad transmedia succeeded in establishing a very successful and entertaining world for a diverse audience for Dr Who. Mercedes-Benz is not an entertainment brand but its recent ME café and newly launched ME convention (in partnership with SXSW) are interesting examples of expanding the experience its vehicles deliver but in a whole new way. consuming experience, which over time, could affect consumer loyalty. In this sense, the total brand experience becomes more satisfying than each of its parts (i.e. touchpoints), compelling audiences to ‘sum’ unique experience sound bites resulting in the creation of greater cultural moments. Image credits: Feature Mongkol Chuewong via 123RF, Designed complexity, © 1957 Disney. global brand strategy and innovation. Follow him on Twitter: brandKzar.